The Mackenzie Tour-PGA TOUR Canada circuit tees off its new season this month and I’m hoping we don’t see a repeat of last year. There was, of course, lots of great golf played last year on the Mackenzie Tour, but something was missing. For the first time in the five-year history of the Mackenzie Tour, there was no Canadian winner in 2017. That’s right, Canada pitched a shutout and in golf that’s not a good thing. Here’s hoping that changes and wouldn’t it be great to see a home-grown boy win one (or more) of the three-event British Columbia swing (the "BC Golf Swing") that kicks off the 13-event Mackenzie Tour season. As you read this, the Freedom 55 Financial Open is underway at Point Grey Golf & Country Club in Vancouver. 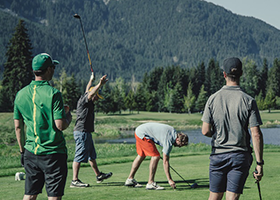 The tour then heads to Victoria for the Bayview Place DCBank Open at Uplands Golf Club in Victoria before concluding the British Columbia portion of its schedule with the GolfBC Championship, which goes June 14-17 at Gallagher’s Canyon Golf & Country Club in Kelowna. As always, the goal for players is finish top-5 on the money list and gain some playing privileges on the 2019 Web.com Tour. The Mackenzie Tour is a developmental tour and in its short history has done its job very well. The latest example of a Mackenzie Tour alumni making it big came last month when former University of Oregon star Aaron Wise won the AT&T Byron Nelson tourney in Dallas. Two years ago, a then 19-year-old Wise won the Mackenzie Tour spring qualifying school at Crown Isle Golf Resort in Courtenay. He followed that up with a win at the Syncrude Oil Country Championship in Fort McMurray and finished fourth on the money list to earn his promotion to the Web.com Tour. A year later Wise, who didn’t finish worse than tied for 15th in seven Mackenzie Tour events in 2016, had played his way onto the PGA Tour. Wise is just one of many young players who have used the Mackenzie Tour to kickstart their professional careers. American Tony Finau and Canadians Nick Taylor and Mackenzie Hughes are other Mackenzie Tour alumni who have gone on to win on the PGA Tour. Others will soon follow. While Wise was winning in Dallas, Robby Shelton, last year’s GolfBC Championship winner, was finishing tied for second at a Web.com Tour event in South Carolina. Lee McCoy and Max Rotluff, the other two winners of B.C. Swing events last year, are also now playing on the Web.com Tour. So the moral of the story is don’t blink or you’ll miss them. The really good players on the Mackenzie Tour don’t make many repeat performances. More often than not, they are gone after one year. Jared du Toit (pictured) was hoping he wouldn’t be back. Du Toit, the 23-year-old from Kimberley made his pro debut a year ago in Victoria. The Arizona State University graduate showed flashes of brilliance, including a course record 10-under 61 in the third round of the GolfBC Championship at Gallagher’s Canyon. Du Toit put together a solid season, registering three top 10s and finishing 23rd on the money list which made him the low Canadian. Du Toit could certainly end that Canadian winning drought this year. So could a guy like Vancouver’s Ryan Williams, who has come so close in recent years to gaining that elusive promotion to the Web.com Tour. Riley Wheeldon of Comox is a past Mackenzie Tour winner who is capable of big things. North Vancouver’s Eugene Wong is back playing the Mackenzie Tour after plying his trade on the PGA Tour China circuit, where he is a past winner. Big-hitting Taylor Pendrith of Richmond Hill, Ont., is another Canadian to watch. He had a huge 2015 season on the Mackenzie Tour, when he had six top-10s in just eight events and finished third on the money list. Let’s hope these guys and some others have those Canadian flags flying high on Mackenzie Tour leaderboards this summer.